With some pre-planning on your part, you can automate your daily trading activities. With most online brokerages, you can find some type of trigger event that you can apply to an individual stock. 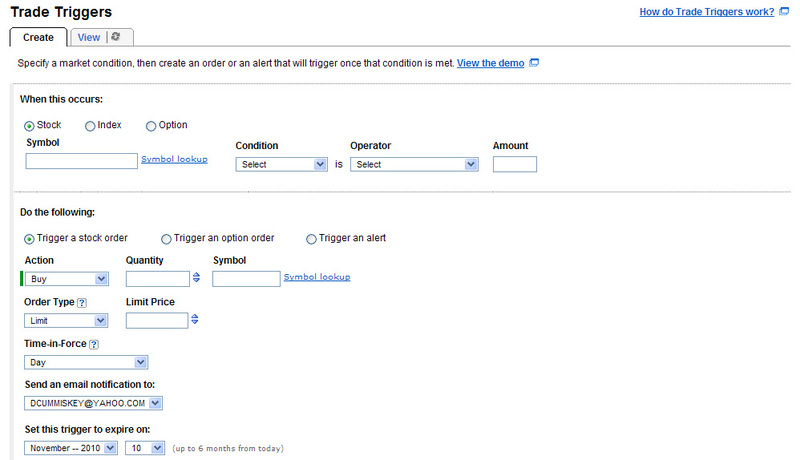 Trade triggers allow you to set entry and exit alerts based on one or a set of conditions. To do this, you need to schedule some time nightly for review of setups from the Bluefin watch lists. I recommend focusing on Sector 50 and Emerging 50. One example, you spotted GGAL in the Emerging 50 list on October 15, 2010. It had a nice multi-week consolidation with tight trading action. Let’s say you wanted to schedule a trigger to email you when the stock trades above 10.70. Let’s use Ameritrade Trade Triggers for the demonstration. First, go to the “Trade”Menu and Select “Trade Triggers” over to the right. The Trade Triggers Entry form will appear. This is where you enter the conditions for your alert. This trigger will be for a stock, click the “Stock” radio button. Normally, this is the default setting. Next, enter your symbol and then the Condition. I typically use “Last” versus “Bid” or “Ask”. Last is the last amount that the stock traded. Operators allow you to set when the trigger occurs on the selected Condition. In this case, I’ve selected “Greater than or equal to”. Finally, our entry point of 10.70 is entered in the “Amount” field. Now we have our condition defined for the alert. When the stock trades at or above 10.70 we want some event to occur. 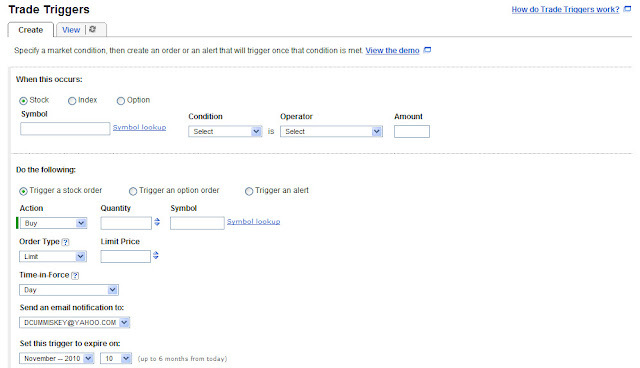 Our event can be: Trigger a Stock Order, Trigger an Option Order, or Trigger an Alert. I typically use “Trigger an Alert”. Why? If you have several of these setup and you have a big thrust day it is possible all 5, 10, 20 triggers will execute your buy orders. Let’s just say, you can use up your daily day trading margin balance really quick! With the email option, you will receive a notification in your email alerting you that your stock just hit your buy amount. When time permits, you can then check out the stock and make the decision to enter or not enter. I like this flexibility but some people might like the more automated option "Trigger a Stock Order" removing them from the decision process. After selecting “Trigger an Alert”, click the drop down menu under “Send an email notification to” and select your email address. Then, pick a date for the trigger to expire. I use a 5 day expiration. You will receive an email when the trigger expires. Finally, click “Submit Trigger” and you are set. 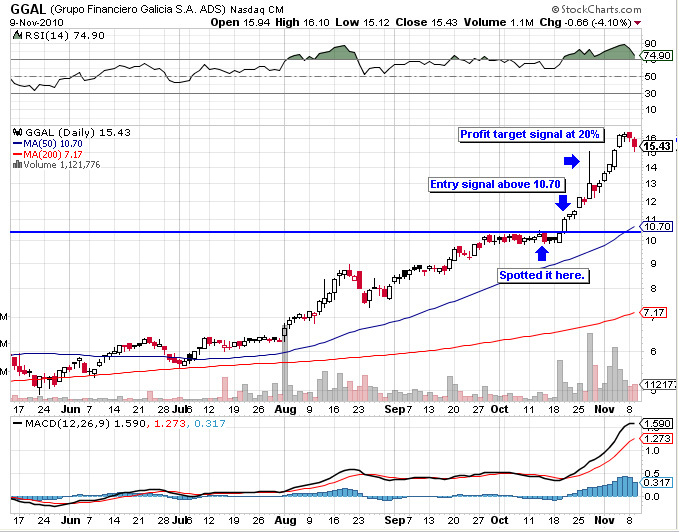 You can run through this process and configure your stocks to trigger a stop alert as well. For many people, it comes down to organizing around their time. If you normally have five to ten minutes free several times a day, you can schedule check-in times where you run through the stocks in Bluefin and make your purchases. My check in times are around 10 EST, 2 EST, and 3:55 EST. If your schedule is less predictable or access is limited you need to use something like trade triggers to notify you. In the evenings, allocate time to review stocks and figure out your entry and stops. Then, it is a matter of entering the trade order when the event does trigger. In the end, it’s about organizing around your time and committing to a daily routine to make it happen. Indeed, You shared amazing post on tips and tricks of how to use trade. All tips are quite impressive. I will surely keep it in mind while trading anything. Thank you! We have trading rules that we need to obey. Trading is not just about making money but is also about discipline. Very interesting and useful facts you have shared regarding trade. Your words are really helpful to all who are looking for best trading strategy. Thank you.